I’m lucky enough to have a boyfriend who’s parents live in Lanzarote, meaning access to sunshine all year round! I usually go out once or twice a year, but my favourite time to be there is during the Christmas period… I usually have Christmas in the UK with my family and then fly out to meet Billy and his family in time for new year. I’m not a fan of new years eve but I’m a big fan of new years day (it feels much more like the start of something exciting), and I can’t think of a better way to spend the first day of the year than sat in the sunshine with a glass of cold, crisp, white wine. This year was slightly different because we were in Lanzarote for Christmas rather than new year, but it was just as lovely and relaxing as always. There is one particular activity that Billy and I make sure we never miss out on, and that is what we term the ‘tapas trail’. 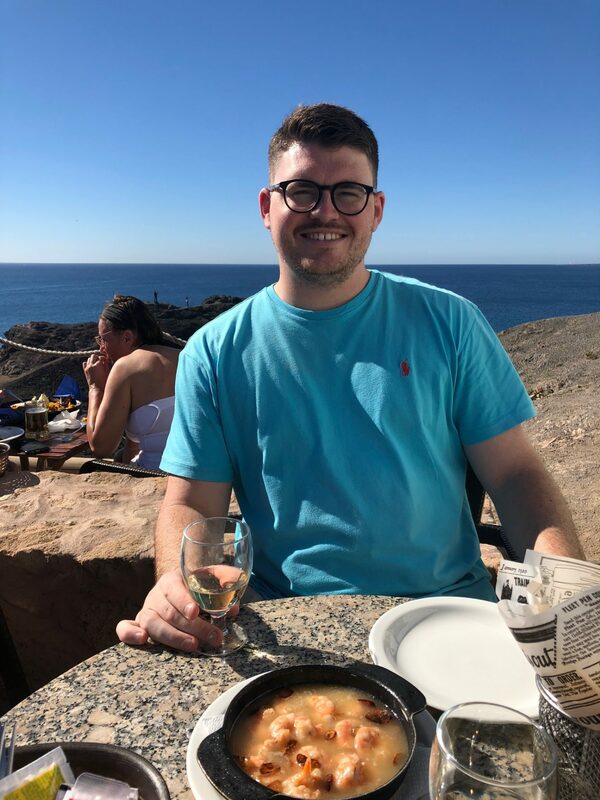 This consists of walking from Billy’s parents house in Las Coloradas along the winding sea path to Playa Blanca’s Marina Rubicon, and then stopping off at various places in the marina for a plate or two of tapas and, of course, a glass of wine. When it comes to tapas, I am OBSESSED with garlic prawns, so I order these everywhere and use them to judge which restaurants are the best. 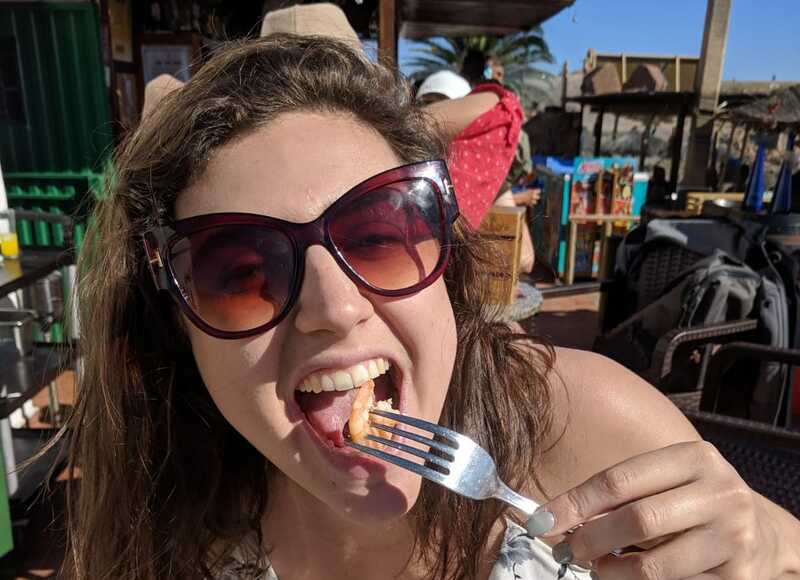 Here are my favourite spots on the marina tapas trail, to serve as a guide on where to eat if you’re ever in Playa Blanca. This was one that we only tried for the first time this year, and I was gutted that we’d spent so long missing out! It felt really authentic with dishes written on a blackboard and food served as and when it was ready. We ordered garlic prawns (obviously), garlic chicken, grilled cheese and beef stew and it was all great… just simple and perfectly cooked, would highly recommend. Harbour View is perfect for sitting out in the sun for hours on end eating and drinking, thanks to a lovely grassy seating area with comfy chairs and a great view over the harbour (you never would have guessed from the name would you?!). The other thing that’s great about this place is that it offers a twist on your usual tapas, so it’s great if you’re looking for a break from your croquettes/garlic prawns/meatballs/stew/patatas bravas. The food here is really good quality and definitely worth a try, but be prepared to spend a little more than other places and get there early because the most popular dishes do sell out. Billy’s favourite thing about this place is the bowl of crunchy snacks that gets brought out with your drink, but my favourite thing about this place is the garlic prawns. Bold statement I know, but Berrugo does the best garlic prawns in the marina. Juicy prawns, perfectly sizzled garlic and the odd (not too hot) chilli. I’d also highly recommend the fried cheese in filo pastry and, if you’re feeling a little more adventurous, the camel cheese. I’m pretty sure my first ever experience of tapas was at Lani’s, when I came on holiday to Playa Blanca with a friend as a teenager. The food is straight-talking and delicious, and the generous portion sizes make it excellent value for money. There’s also loads of choice on the menu with burgers, kebabs and spit-roasted chicken alongside the extensive tapas selection, so it’s perfect for fussy eaters. My favourites here are the ribs, fried aubergine with palm honey, garlic prawns (obviously) and croquettes. Aside from the food, the fish are a highlight here… not to eat but to admire! You can watch thousands of them swimming around through sections of glass flooring, and the waiters will usually bring out bread especially for you to feed the fish over the side of the decking. Tip: for tapas make sure you head to the snack bar rather than the restaurant! Whilst the tapas are good here, they’re a bit on the expensive side compared to the rest of the marina so we usually just stop for a drink. 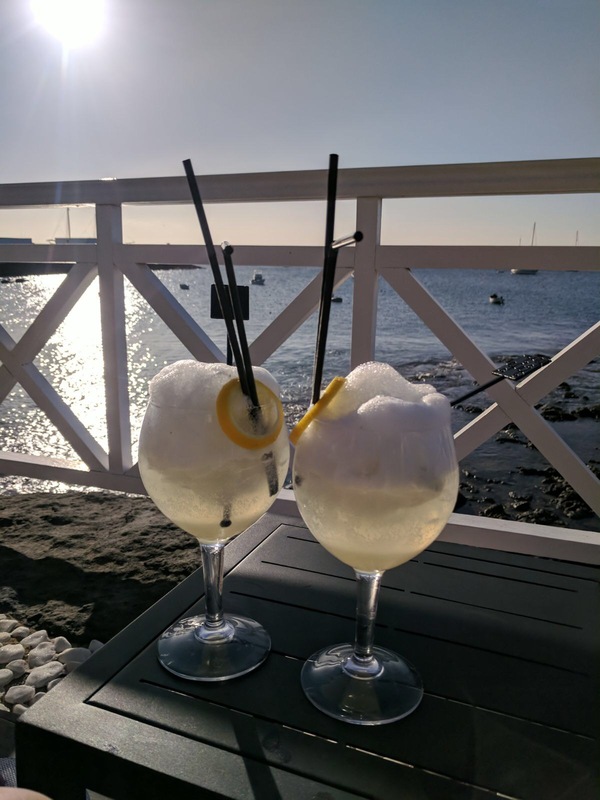 It’s my favourite spot in the marina because the sangria is fantastic and its the perfect spot for watching the sun set over the sea. Coupled with comfy sofas and chilled out background music, you couldn’t feel any more ‘holiday’ if you tried. Oh, and as well as the sangria I would highly recommend the Gin Fizz cocktail! We’ve not been to One Bar for a while as it’s at the end of our trail and we usually get distracted by the El Mirador sangria before we make it that far. This bar sits at the end of the marina overlooking the harbour entrance and the sea – not only is it great for yacht watching, it’s also a proper little sun trap! As we haven’t been for a while I can’t remember the specifics but I do remember that the croquettes here were the best on the trail – we tried a couple of different ones and I polished off a load of mushroom croquettes despite not like mushrooms, so they must be good! Before I go, I need to mention two other places which aren’t on the marina tapas trail but are 100% worth a visit if you’re in Playa Blanca. The first of these is Casa el Barba. It’s a little out of the way but can be reached by car or, even better, by walking along the Papagayo beaches for about an hour. I absolutely love the romance of walking along the beach with my feet in the sea, stopping for lunch and a glass of wine with a serious view and then strolling back at sunset. There’s a variety of dishes on the menu that are perfect for a light lunch including a few tapas dishes and sandwiches. But the thing that sets Casa el Barba apart (other than the fantastic location) is the fresh fish… Billy and I usually share the fish of the day with some chips and house wine (another reason to visit this restaurant). The wine is grown and made locally and comes in an unlabelled bottle. It’s so good that one bottle turned in to three on Boxing day this year, and it didn’t even give me a hangover! The second one is Alfie’s Bar & Kitchen in Las Coloradas. I’m a little biased here because it’s owned by Billy’s family, but honestly it’s really, really good! Alfie is excellent at making cocktails (his Sangria in particular is the best I’ve ever had), you’ll also get a warm welcome and the food is spot on. Everything is homemade by their chef, Marie, and is mega tasty and satisfying. I’ve tried the steak & ale pie, prawn curry, white Toblerone cheesecake and Rolo cake but I’ve seen a lot of dishes go out and they all look amazing. They do roast dinners on a Sunday and afternoon tea as well if you’re really missing home! 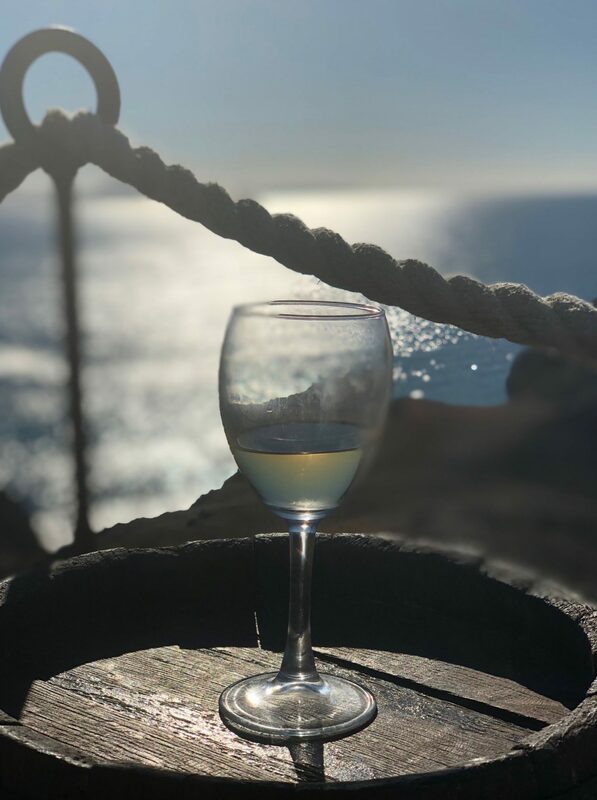 So there you have it, a tapas trail and a couple of bonus recommendations incase you’re visiting Playa Blanca. 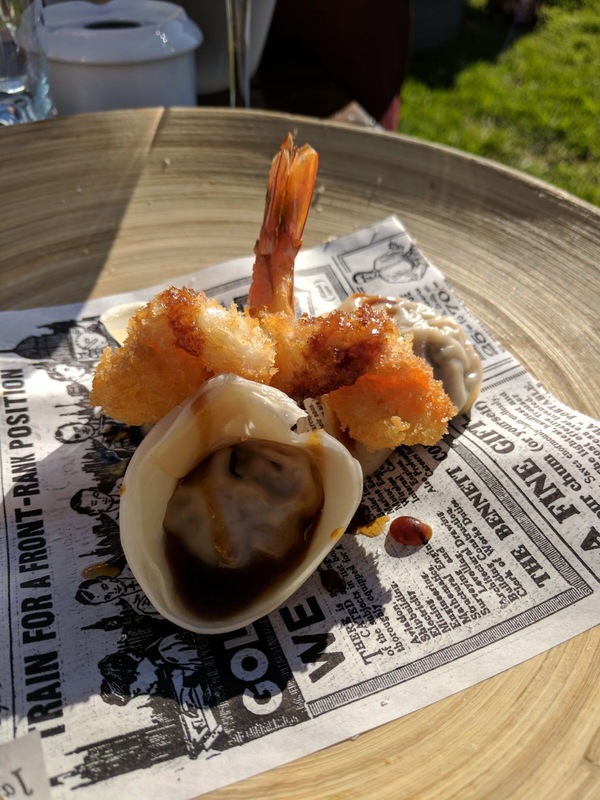 And if you’ve been, I’d love to hear where you’ve eaten… Recommendations for quality garlic prawns are always welcome.